Pingus Game - Download and Play Free Version! 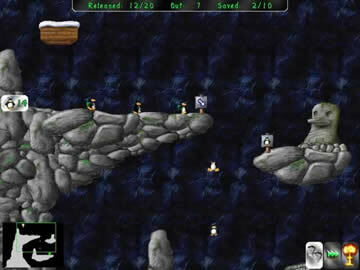 Strategically Control Penguins With Various Abilities In This Fantastic Lemmings Style Puzzle Game! Pingus initially seems like a very simple game with an equally simply concept: direct as many penguins to safety as possible. It quickly becomes apparent that there is a lot more to these puzzles than meets the eye since the penguins have their own ideas about things. Suddenly what was once a stale and static puzzle comes alive and actively works both for and against the player. This is addicting, to say the least. You seem to have a real way with these penguins. Was it a natural gift that you were born with, or was it a skill that you cultivated over time? Whatever the reason, these penguins will do anything that you tell them to do. Want one to jump off a cliff? No problem! Kamikaze style blow up? Coming right up! The penguins are somewhat expendable but they don't seem to mind much. They are just another piece of the puzzle, but they don't just sit still until called upon. They move freely and do as they want until you give them a specific command. It takes a quick mind to command the penguins and direct them before they get themselves into trouble. There are all sorts of fun skills in this game including wall climbing, floating, bridge building and even exploding. Each level gives you a set number of each penguin specialty, making these penguin skills another element of this deceptively complex puzzle. * Open Source Means Free Gaming! 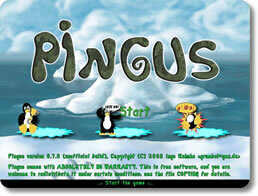 Pingus is a free game released under a GNU GPL license. It's free for anyone, and is compatible with Linux, Windows and Mac. With 22 levels to play through, Pingus has great replay value. Pingus has a definite storyline which is revealed during an intro at the beginning of the game. The message in the story appears to be that global warming is bad. Pingus delivers this message in a manner that seems most natural, and not heavy handed in the least. In life, there is always more than one way to accomplish something. In video games, there is often only a single solitary way of achieving a goal that the game will recognize, and this seems very rigid and unrealistic. In Pingus, if you can get your penguins to the exit, you've won. It doesn't matter how you did it, and this is what makes the game so playable. Pingus is a game that will make most video game players happy because of the replay value and the ever changing nature of the puzzle itself. It's a game that's always fresh and interesting.